A growing awareness that my pile is its own self-starter and can sustain itself as it consumes itself, didn’t stop me from striving a season or so later with another act of nurturing rather than letting nature take its course. I have a heavy-gauge tarp, about 12 by 12 ft., brown on one side, gray on the other. I didn’t buy it new but came across it while helping a friend clean up the backyard of his new rental house. We found it under a thick pile of leaf mold in the back corner of his yard. Evidently a previous renter had simply dragged the tarp full of leaves off to the side and left it there. Seasons of more leaves had covered it until only a grommet in the corner stuck out from the deep covering of rotting leaves and branches. We had to shovel the leaf mold from most of it before fully unearthing the whole tarp, but once revealed, it was hardly worse for wear. 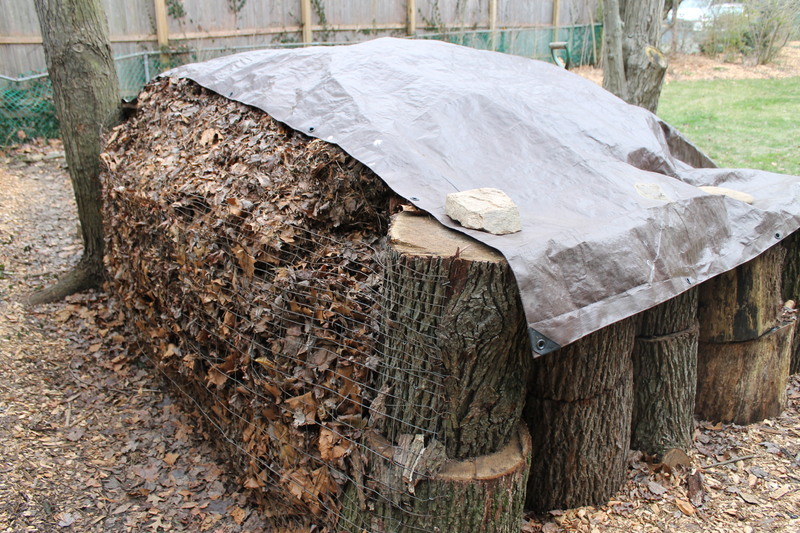 In a reversal of circumstances, one cold January several years ago I unfolded the stiff brown tarp and spread it across my pile, anchoring the corners with four large rocks. My pile was just large enough side to side to spread from one log wall to the other, but not big enough to cover both the front and back. I anchored the front end by setting a flat rock on a shelf of leaves, just off the ground. The tarp covered all but the last foot along the backside of the pile. An Arctic Clipper was on the way, with a forecast of below-zero overnight lows through the week. Even though I keep my pile as sizable as I can, I figured the kind of cold snap that could freeze the local pond thick enough for skating could shut my pile down completely until the spring thaw. The next morning I inspected the pile to find a row of icicles dripping down along the rear side of the tarp. It seems that water vapor, trapped by the tarp, had condensed up under the insulated covering, then drained along the underside off the lowest point of the tarp back into my pile, where most of it froze again. A nice feedback loop. A plastic tarp mostly covered my pile during a cold spell. A gust of wind would occasionally fling one corner of the tarp back upon itself, tossing its rock capstone off the log wall. But over the course of a week the brown plastic blanket kept the leaves on top of the pile damp during the day, capturing the steam vapor. The experiment was a success, at least in keeping my pile cooking. When the cold front eased up, I took the wraps off my pile. I had a full bucket of food scraps to tuck inside and besides, I missed my pile’s mottled autumnal colors, being able to check how it subtly shifts and sags, poking it with my rebar aerator. What’s more, another storm, this a blustery, rain-driven Nor’easter, was on the way. Unless I weighed it down with gobs more rocks, I feared it would take sail or be torn to shreds. Stuffed as it is with a surfeit of parched brown leaves, what my pile always needs at this point in its life cycle is water to keep cooking away. Full steam ahead! My pile has proven itself big enough to “take the wraps” off. Even on a frigid morning, steam vapors rise from deep within to freeze as hoar frost on the surface. A much more interesting sight than a plastic tarp!